Two Minnesota residents, 30-plus years apart in age, found common ground on a frozen lake. They have been skating together ever since. “The benefit of older friends is that they have perspective and knowledge,” says 54-year-old Erik Wardenaar about his skating partner, Penny Jacobs, 88. Ask older adults involved in an intergenerational relationship and they are likely to tell you that it enriches their life, bringing a vibrancy and freshness that is different from friendships with people their own age. The opportunity for a mutual knowledge exchange. You’ve had experiences the younger generation has only read about in their history books. Something as simple as having to use a payphone to call home is a completely foreign concept to today’s children and teenagers. Sharing your firsthand knowledge is a great way to leave a legacy and impart some wisdom. Don’t think your young friends don’t have knowledge of their own to impart! Ask them for help to learn more about social media or see if they know any tricks to get the most from your newest tech device. The chance to grow your support system. We may experience the loss of family and friends as we get older. Building relationships with younger generations is one of the best ways to combat the feelings of isolation and loneliness that can lead to depression in older adults who have lost people that were close to them. The ability to improve your overall health. Spending time with children can cause older adults to burn 20 percent more calories per week. Older adults who make the most of intergenerational socializing opportunities are also less likely to experience a fall and tend to perform better on memory tests. These lasting contributions can involve: teaching a skill, such as quilting or wood carving; imparting knowledge, such as a deeper understanding of poetry or music; or sharing wisdom gleaned from experiences of love and failure. Or the legacy can live on in a community rather than a person. “If we can improve the standing of older adults in society, and nurture what they can bring through intergenerational connections, then we can achieve a better community with a better quality of life for all ages,” Susan writes. Volunteering at a school, library or with a youth group is a wonderful way to spend time with the younger generation. Just contact the organization or your local United Way for more information about volunteer opportunities. Join a club or activity or sign up for a class. You might choose something you enjoy doing, like playing chess or sailing, or a skill you want to learn, such as a speaking a foreign language or making jewelry. Whatever it is, you are likely to be able to interact with people of all ages. Consider moving to an intergenerational retirement community such as Kendal at Oberlin. 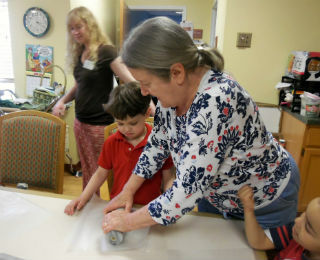 Residents have many opportunities to form intergenerational relationships with students of all ages, including children who attend the Early Learning Center, located on the Kendal campus, and students from Oberlin College. And finally, be bold. Skater Penny Jacobs approached Erik with the idea of skating together. Not only did the two find a beloved activity to share, but have become friends off the ice too. If you’d like to get to know someone, ask them if they’d be interested in meeting for coffee and conversation. You might be pleasantly surprised at their response.